On the second day of our stay in Amsterdam we had booked to go and see Anne Frank Huis, but not until early afternoon. We decided to head out early and go for a walk around the city to see what we could see. Our first stop was at Leidsebosje, which is home to Amsterdam’s widest trees. There are two plane trees here with reported circumferences of 6.5 metres. Now a circumference of 6.5 metres sounds large. You may imagine massive, swollen trunks, old and gnarled with age, supporting trees the size of skyscrapers. You may imagine roots anchoring themselves deep into the ground, snaking through the soil and breaking through the bedrock below, reaching for miles below the earth’s crust and supping the liquid lifeblood from its very core. You may imagine branches stretching their arms into the jet stream above and tickling the underbellies of passing aircraft. You should not imagine all of this. The 6.5 metres relates to the circumference of the trunks and not the diameter. Please don’t be disappointed, though. They are still very large and very attractive trees. And if you look carefully, you might be lucky enough to see the small figure of a woodcutter. We spent quite some time looking for him, but all of a sudden there he was, perched on a branch and trying to saw away industriously. This little man was apparently put in place by an anonymous sculptor. He has been there for a long time; look how the tree has begun to embrace him as a permanent appendage, growing slowly around him; absorbing him. The woodcutter’s saw is stuck fast, and his boots are no longer metal, but wood – how very fitting for a country well known for its wooden shoes! The poor woodcutter was clearly rooted to his spot. There was little we could do to help him, and he seemed quite at home. We left him to it and continued on our way. 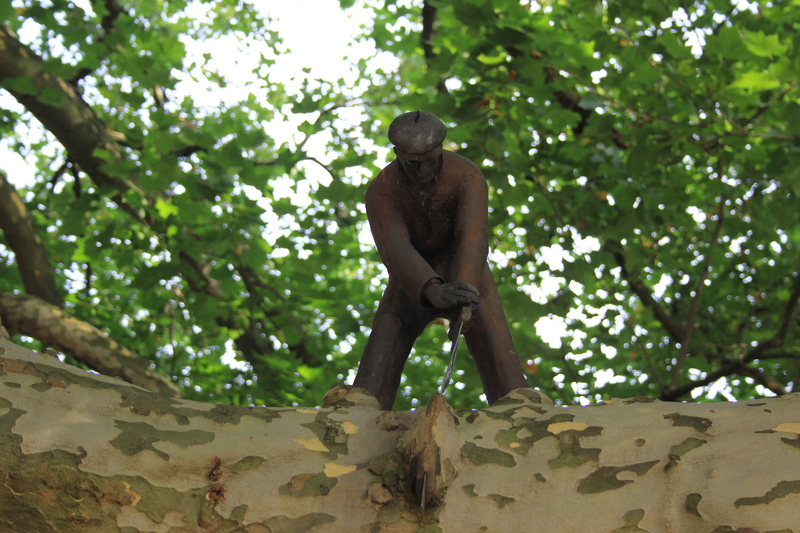 This entry was posted in Netherlands and tagged amsterdam, leidsebosje, sculpture, travel, trees, woodcutter. Bookmark the permalink.